ARKAZUM "Son of the Imperium"
WC: Hello, Griff. 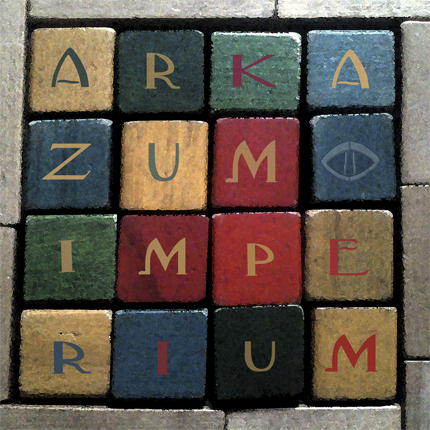 I want to start things right off by talking of the new Arkazum album, "Imperium"...Is there a certain mood of feeling you harbored while recording this music, and what were these sessions like this time around? How did it differ from "Muzakra" or "Zekond", not only in music, but in themes, overall? Tell us a little about all these releases, and what you remember in crafting these songs? GRIFF: Greetings. Well, "Imperium" is the latest and third Arkazum offering, the songs on this one have been a long time coming & were generally fitted together through little ideas and recordings I’d been doing over the past year and a half (although some lyrics have been culled from the midst of time!). I started properly putting the tunes together in early 2013. I don’t think there was any particular mood so to speak whilst recording. Mainly I was striving to get a better level of recording and engineering to thus get a better sound out of the songs. I’m still a little disappointed with "Muzakra" but as some those tunes were all home recorded on an old PC and over 10 years old I’ll let myself off! "Zekond" was a more sincere attempt at getting a better sound with better gear. I also wanted to increase the length of songs in "Imperium" as I was getting fed up trying to restrict myself keeping everything as short as possible. WC: With Arkazum, you compose all the music yourself, if I am correct? Did you train yourself to play the different instruments long ago? G: Yes, Arkazum is a one man effort, a labour of love & a rabid consumer of pennies. I play guitar, bass, keyboards & vocals to varying degrees of listenability. I have to rely on using drum software VSTi & found good results using Slate drums. Yes, I’m self taught & have been tinkering around and meandering for a good few years now. WC: When you write songs do you have a certain formula that you stick to, as in the overall album itself, or do you write songs on a song by song basis? G: That’s a hard question! My songs seem to come about in drips and drabs, ideas are put down & recorded when the inspiration comes. This time I tried to get the overall recordings sounding similar because I had a problem with "Muzakra" being all disparate & not gelling. I wanted to get away from all that & achieve a more cohesive listen. So I guess, yes ,this time I did have a certain formula & it’s one I think works better. For instance, I generally used the same guitar sound & eq. WC: What was the reunion like with your old band mates Cathedral, and the recording of the Anniversary live record? What was it like to play again in front of an audience? G: You know what? I enjoyed almost every minute of it. It was great to meet up with the good lads again, reminisce about the old days & go through rehearsals. Even though the weather conspired to try and add a little misery as it started snowing during late November. You do know that a single flake of snow here in England shuts down entire cities, so it caused us to trudge through miles of snow to get to the rehearsal room. Adam’s beer cans are still lost somewhere in the arctic tundra on the outskirts of Leeds & he’s still up there now, looking for them with a tear in his eye. The gig day itself was slightly nerve wracking as I hadn’t done anything on stage since about 1997. The whole of Forest had never been performed live in its entirety so there was a sense of occasion to it added to the fact it was being recorded as well, so I was conscious of not messing up my bass parts. Playing live again was strange at first but I gradually got back into that old feeling, the crowd were great & spurred us on. It felt sad in a way as well, as this was the last time we’d be doing Cathedral stuff & it resurrected all those old feelings I’d thought I’d forgotten about. I felt we put on a good show, it sounded mighty on stage & the crowd enjoyed it which is what at the end matters. WC: What are you reading on these days, literature wise? Would you take the time to tell us about this, and perhaps, some of your favorite books and authors? G: My eyes have been reading masses of epic fantasy books such as Robin Hobb – The Farseer & Tawny Man Trilogies, George RR Martin’s - Song Of Ice & Fire. Joe Abercrombie – First Law Trilogy. 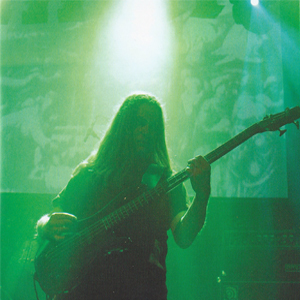 WC: You were there in the early days of the doom metal scene.. What attracted you to such a style, and what can you share with us about these days? G: I guess I was looking for new music. Once I heard Candlemass, Trouble and Vitus etc I was hooked. They had that certain power & emotion to their music. During those days I was like an obsessed evangelical maniac, finding out about bands like The Obsessed, Revelation, Dream Death, Stillborn, Count Raven, Internal Void etc bands no-one around me cared for or had even heard of. It was an exclusive select sect of believers, ha ha. Out of all that I wrote "Under The Oak" fanzine & of course tape trading with a great chap called Nigel Fellers (R.I.P) he was the one to turn us on to bands like Asylum (Unorthodox), Pentagram rarities, Paul Chain & loads of obscure bands. I used to wait with bated breath for his fantastic packages of doom to fall into my letter box. All this was pre-internet of course. I was desperate to hear all that dooming stuff. WC: Do you keep current with any of these bands, or have any favorite doom songs you still hold dear? G: Yes, I still like to listen to Trouble & The Obsessed, Unorthodox, old Candlemass etc from time to time. I’m really looking forward to hearing the new Trouble album. WC: What sort of music do you listen to these days, if any? G: I’m still listening to a mixed bag of stuff that I’ve always liked really; punk, prog, heavy bands - usually Hawkwind, The Stranglers, The Clash, Ian Dury & The Blockheads, Zappa, The Doors, Steeleye Span, Antisect, Amebix, Killing Joke, old Punk bands, Van Der Graaf Generator, Here and Now, Gong, Sabbath. Some of the “newer” bands I like are Tragedy, Morne, 40 Watt Sun. And of course, if I’m allowed to mention, the fantastic Count Beetle. WC: As far as films and movies are concerned, how interested are you in this, and do you have any films you still enjoy as classics to you? WC: Have you ever considered playing live again, and with Arkazum, or will you keep it within a studio context? G: have thought in me own little tiny mind about making a band again. But because of time restraints, real life, finances etc I really can’t see anything happening at the moment. But never say never! I’m quite happy in my own little bubble really. WC: Of your days as a roadie in Carcass, what stands out in your memory, and how was this experience? Do you still remain mates with any of the old band members today? G: Yes, I’m still friends with all the Carcass chaps, I don’t see Bill or Ken much at all these days as they don’t live round these parts anymore but Jeff is one of my oldest friends and I drink many colds with that delightful little fellow at our local hostelry. I had a great old time with Carcass back in the day. What can I say really that stands out? Enjoying their beer rider? Helping young stagedivers off the stage then getting twatted in the guts with a flying bottle? Rescuing a guitar from the crowd with my leg being pulled back into said crowd? Smoking dirty roll-up ciggies onstage like an old Steptoe whilst plugging Bill’s lead back into his pedal? Trying to use my Mum’s ancient, overheating home projector at a gig with upside down slides stuck inside whilst the backdrop falls down? Being accused of having numerous people die because they’ve sat next to you? Or maybe having to convince the rest of the band not to leave a love-smitten band-member behind in Switzerland as he was very late getting back to the van from kissing a lovely girl, all night. Ahhhhhh. WC: What does the future hold for Arkazum, within your sight? Do you have more music recorded to release? G: I’ll probably just spend ages recording more music, release it to nobody on earth and maybe, if lucky sell two copies and be ignored, just like this time, and the last. And the time before that! Nothing recorded yet. There’s some little ideas and what not. I’ll just take my time again. G: Ah, cheers much appreciated. Thanks. All the best to you & your doings.